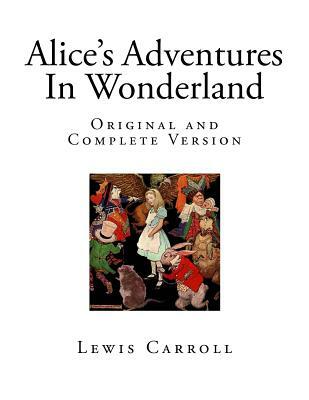 Alice's Adventures in Wonderland by Lewis Carroll - Classic Novels - Brand New Copy - Alice's Adventures in Wonderland (commonly shortened to Alice in Wonderland) is an 1865 novel. Written by English author Charles Lutwidge Dodgson under the pseudonym Lewis Carroll. It tells of a girl named Alice who falls down a rabbit hole into a fantasy world populated by peculiar, anthropomorphic creatures. The tale plays with logic, giving the story lasting popularity with adults as well as children. It is considered to be one of the best examples of the literary nonsense genre, and its narrative course and structure, characters and imagery have been enormously influential in both popular culture and literature, especially in the fantasy genre. Charles Lutwidge Dodgson (27 January 1832 - 14 January 1898), better known by his pen name, Lewis Carroll, was an English writer, mathematician, logician, Anglican deacon, and photographer. His most famous writings are Alice's Adventures in Wonderland, its sequel Through the Looking-Glass, which includes the poem Jabberwocky, and the poem The Hunting of the Snark, all examples of the genre of literary nonsense. He is noted for his facility at word play, logic, and fantasy. There are societies in many parts of the world dedicated to the enjoyment and promotion of his works and the investigation of his life.